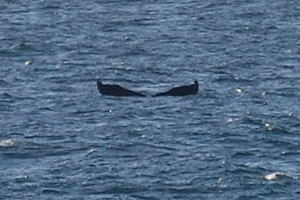 The tail of a diving humpback. Every year from June to August thousands of humpbacks from the waters off the Dominican Republic pass the east coast of Newfoundland on their way north to feed on herrings, capelin and krill. They are accompanied by numerous other species and dolphins. Orcas are also occasional migrators. Although the whales will be visible from the coast with binoculars, it is well worthwhile to take a boat to have a closer look. 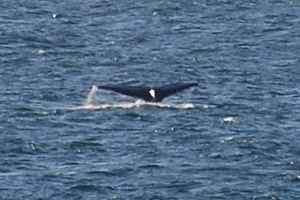 More than a dozen species of whales frequent the waters of Newfoundland and Labrador, but the humpback and the minke are the two most commonly seen. In fact, you will find the worlds greatest concentration of feeding humpbacks along Newfoundland's east coast, numbering in the thousands each year. Weighing in about 30 tonnes for an adult, the humpbacks are nevertheless extremely graceful. Quite often a tour boat skipper will discretely follow a pair or a pod of whales as they cruise the water looking for food. They'll dip below the waves for minutes at a time and then surface with a whoosh from the blowhole. Or one will breach - jump completely out of the water and land with a mighty splash. 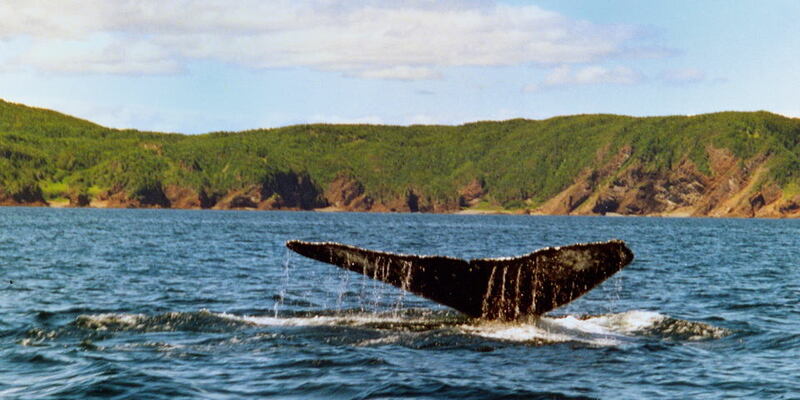 Humpback near Conche, Northern Peninsula, July 2002.